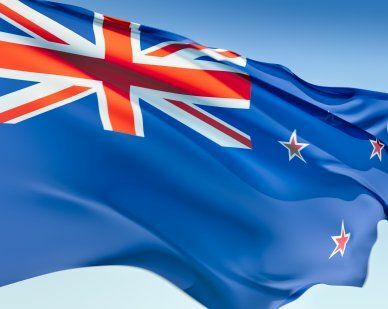 The New Zealand flag was introduced in 1869 but was not adopted until 1902. New Zealand gained independence from Britain in 1907. Before 1869 New Zealand used the British Union Jack flag. The blue background of the flag represents the sea and the sky. The four stars are positioned to symbolize the Southern Cross, a constellation that is prominent in the southern hemisphere. The Southern Cross represents the stars Alpha, Beta, Gamma and Delta and is used to show the location of New Zealand geographically. The Union Jack flag is used in the upper left corner to show the country’s British heritage. Our top-quality New Zealand flags conform to all official specifications. Emblems and designs are executed with the highest possible degree of accuracy in regard to detail, color shades, placement and proportion to flag size.